Steve Gunn, who signed to Matador, is on tour now and playing a handful of shows in Austin for SXSW this week. 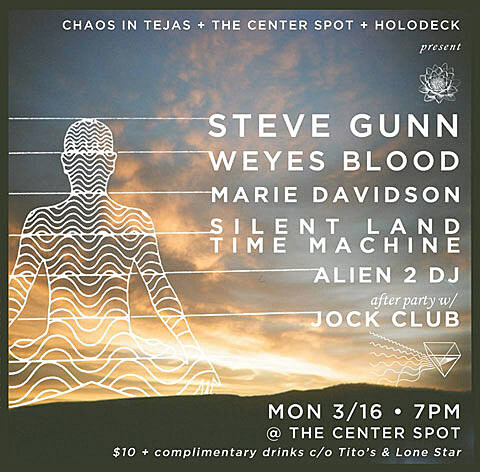 Before the music portion officially kicks off, he plays a show at The Center Spot TONIGHT (3/16) with Weyes Blood, Marie Davidson, Silent Land Time Machine and DJ Alien 2. Plus there’s an afterparty with Jock Club. That’s $10 at the door and there will be complimentary drinks courtesy of Lone Star Beer and Tito’s. During SXSW’s music portion, Steve plays two House of Vans at Mohawk shows: Transmission’s Tuesday night (3/17) show with Angel Olsen, Speedy Ortiz, Waxahatchee, Torres and Ryley Walker; and Pitchfork’s Wednesday (3/18) day show with Rae Sremmurd, Courtney Barnett, Viet Cong, Speedy Ortiz and Torres. He also plays the Third Man Records Truck on Wednesday. Tonight’s Center Spot show is co-presented with Chaos in Tejas who also host The Spits, Iceage, Lust For Youth, Untold, Sheer Mag, The Ukiah Drag and Residuels at Beerland Saturday (3/21) afternoon. That’s free.